Epitope Binning is a means of antibody validation in which monoclonal antibodies are tested against one another to determine which antibodies compete for the same antigenic epitope. Antibodies which bind to identical epitopes are grouped together into "bins". Antibodies which are grouped into different bins are considered to be independent from one another, hence the name independent antibody validation (Figure 1). Independent antibody validation is used to identify which antibody pairs have higher specificity and/or sensitivity in various experimental platforms. Figure 1. Independent Antibody Pairs. (A) An antigen can have multiple epitopes in which an antibody can bind. (B) If two mAbs bind to same epitope on an antigen, they are considered to be in one bin. (C) However, if two mAbs both bind to the same antigen, but at different epitopes, they are considered to be in separate bins. Final Delivery: An epitope binning test report identifying all "independent pairs"
The grouping of monoclonal antibodies into individual epitope bins has benefits for both basic research and therapeutic discovery. Some of these benefits include…. Each epitope corresponds to a different mechanism of action, ensuring that mAb's in the same bin have identical functionality. Therefore, by targeting different epitopes on one antigen, it is possible to increase the end effect by simultaneously activating multiple mechanisms of action. Researchers can easily reduce the number of potential lead candidates by eliminating mAb's which target the same epitope of a non functional clone. It is important to identify which epitope elicits the strongest effect rather than depending on the usual bias's to choose mAb's with the highest affinity or the most common epitope. This analysis can be accomplished by comparing the efficacy of mAb's which belong to different bins, ensuring that the most functional mAb-epitope pair is chosen for further analysis, rather than one chosen through bias. Coat an ELISA plate with protein antigen. The non-bound antibodies will be washed away, leaving only the bound antibodies on the plate. HRP labeled streptavidin will be added to the plate in order to visualize the amount of bound testing antibody through spectrophotometry. The competing antibody will be added to the plate and allowed to bind prior to the testing antibody (with labeled secondary). HRP labeled streptavidin will be added to the plate in order to visualize the amount of bound testing antibody through spectrophotometry via Octet RED 96. After GenScript performs epitope binning on the customer selected purified mAbs, you will receive an epitope binning report explaining which purified mAbs belong to which epitope bin. An example report is shown in table 1. All biotin labeled testing mAbs will be shown on the top of the table, while the competing mAbs will be labeled on the left side of the table. The numerical results of the direct ELISA evaluating the competition between each testing and competing antibody is shown in the corresponding section within the table. It is important to remember, that only the bound biotin labeled testing antibody was measured, therefore a low percent binding number indicates that the test mAb was unable to bind when in the presence of the competing mAb, indicating that they both bind to the same antigen and therefore in the same bin. Table 1. Example of Epitope Binning Report. The example epitope binning report contains the percentage of testing mAb which binds to a specific epitope when a competing mAb is present. The above table indicates that mAb I, mAb II, and mAb III belong to the same bin and are independent from mAb IV. Interested in Learning More About GenScript's Custom mAb Generation Services Perfect for Independent Antibody validation? Want to Try a Non-rodent mAb? Learn more About Our MonoRab™ Rabbit mAb Generation Service Which Includes Independent Antibody Validation for Free! Increase mAb Specificity with GenScripts Premier Rabbit mAb Generation Service. Perfect fit for Anti-ID and IVD Applications! Unsure which service line is approproate for your application? 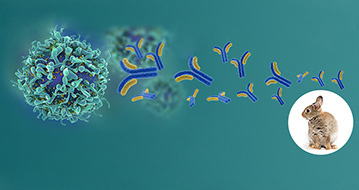 Try our Antibody Service Selecting Tool.